If you truly want to help people, the concept of “From the Ground Up” should be well understood and utilized on a daily basis in the gym. Training from the ground up simply means that it’s best to start on the ground before working your way to your feet. The floor is the safest place for you to begin. While on the floor, gravity has less of an effect on the body. Since we’re able to take gravity out of the equation, basic stability tends to improve. The floor is giving extra support and stability, so learning basic moves becomes easier if you start on the floor. I pretty much have all my clients start there…on the floor. After foam rolling and knocking out a couple quick corrective exercises based around their weakest link, our clients all start on the ground. Exercises will vary from individual to individual since we’re all unique and we all have our own little quirks we need to work on, but the concept of starting from the ground and building our way up is apparent in each training session. Have you ever heard of the 4×4 Matrix? Dr. Greg Rose, one of the top guys in the FMS, SFMA, and TPI, created this little nugget of information that I use ALL the time. At least that’s where I caught wind of the 4×4 Matrix. Whether Dr. Rose created it or not, the concepts of the 4×4 Matrix has allowed me to get outstanding results in less time. I’m going to list out the 4×4 Matrix and what it means, but I’m really only going to elaborate on the left side of this table. 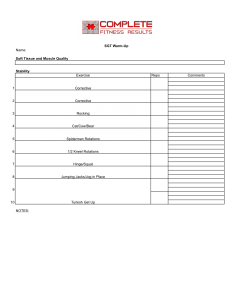 If you look at the table above, illustrating the 4×4 Matrix, you’ll see “position” on the left side. Notice how the position starts on the ground, moves to quadruped, then kneeling, and finally standing. This is where the concept of “From the Ground Up” begins. We must first be able to perform an exercise well on the floor before we’re going to have success in the next position…usually. After the movement screen, it’s time to start training. We customize the warm up’s. We customize the strength and power portion of the training program. We tailor everything they’re doing to push their limits whether that’s simply learning how to move an arm overhead with control or progressing all the way to something as complex as a push jerk. So, the next time you’re building a training program, remember the 4×4 Matrix. Remember that starting on the ground and building up will enhance results. We have two resources to check out to help explain this concept a little better. First, there’s going to be an in-service Steve did at our gym a couple years ago. Steve covers breathing by position and takes you from the floor, to quadruped, to kneeling, to standing. You’ll be able to see that left side of the Matrix in action and start to understand why we start on the floor. Build the base and start to go more vertical. The next resource we’re going to provide you with is a snapshot of our current warm-up we’re using in our group training program right now. Notice how we begin with the breath on the floor (the most basic, most supported position), we stay in supine, then we move to quadruped, then kneeling, and finally standing. The exercises build in complexity and follow the Ground Up approach. So, the next time you’re building your training program, start to think about building the foundation on the floor and progressing from there. 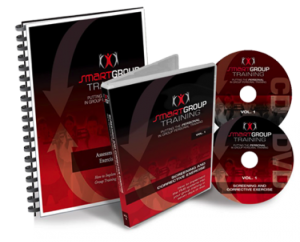 If you’re looking for more info on how to build your training program based upon the results of the Functional Movement Screen, be sure to check out our resource: Smart Group Training Volume One – Screening and Corrective Exercise. In this resource we’ll show you an exact, step-by-step implementation plan to incorporate screening and corrective exercise into your group training program. This is much easier than you probably think, but no need in re-creating the wheel. Check it out!